Away from the formal service of traditional Indian hotel brands like, say, Taj or Oberoi, the W brand is shaking things up with the launch of its Goan property - the first in the country - on the sandy stretch of Vagator Beach. Against the backdrop of a 500-year old Portuguese fort, the property has been designed by Singapore-based Eco-ID architects to feature a 160 guestrooms, villas and public spaces set over 25 acres of land. Inside, the Malaysian firm Design Wilkes has created a vibrant, colourful space with a strong sense of place; enormous, perpetually opened doors, adorned with lunar artwork by Subodh Kerkar - a nod to the region’s full moon party culture - sets the scene for the humming open-air lobby which is dressed with colourful low-slung furniture; a ceiling rope installation reminiscent of the local fishing heritage; and a vivid mural, by Indian artist M. Narayan, that celebrates the evocative melting pot of Goa. The guestrooms - which also comprise a series of villas - are similarly flamboyant with hammered metal furnishings that reflect the kaleidoscope of colours. Of course, this being a W Hotel, the facilities are second to none, with a state-of-the-art fitness centre; an impressive subterranean Clarins spa - that offers a range of classic treatments - two bars and two restaurants, including the pan Asian-themed Spice Traders and Kitchen Table which serves up Goan sepcialties. 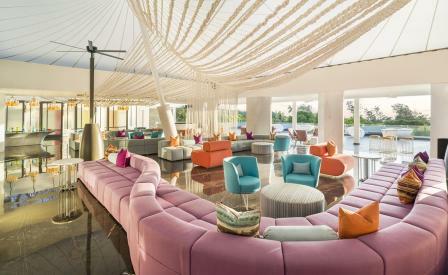 We suggest heading to Rock Pool - a hotspot that has fast become a place to see and be seen - where locals and guests sip on cocktails to the beats of the house DJ while the sun sets slowly over the Arabian sea.